Don't you need this nice set for your kitchen? Great kitchen tools set for the beginner cook, the new apartment dweller, newlyweds, or yourself! This 41-Piece Kitchen Cutlery and Cooking Utensils Set is a good choice for basic cutlery and utensils plus measuring cups, spoons, etc. for a good kitchen setup. If you desire a nice variety of kitchen gadget items, including a number of paring, steak, and utility knives with precision blades, then select this chef utensils set. It includes a wood storage block and cutting board. Wood storage block Keeps cutlery close at hand for easy access during meal preparation and cooking. 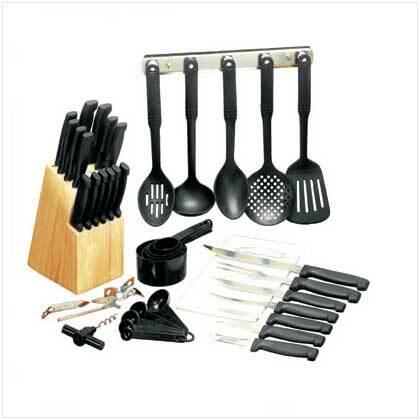 Cutlery assortment Offers a utensil for almost any job during meal preparation. Hanging rack for kitchen utensils Can fit on a wall under a cupboard or beside the range. Knife blades Are precision, sharp, and serviceable.